even with a beam width of only 2.5 degrees, at 2000 km, your resolution cell is a circle with 87 km in diameter, pretty much only useful for early warning"
but the main purpose is to get coordinates and movement parameters from a formation of targets be it ships, drones and aircrafts. Also the nice Ventral area aircrafts have in comparison to missiles is drastic. I don't think there are any airborne jammers as far as I know on aircrafts that can jam HF or stealth material that can absorb HF. I am sure the readings of an aircraft and missile to the amount of surface area they have can be measured out. "There is a limit to how close you can hop (because otherwise your wave can't bounce back), it called the skip zone, when you have a blind spot 800-2700 km in front of you,"
OTH radars provide multiple skip zones to cover for those blind areas. I don't know the exact time intervals it would take for HF waves to reach back to the receivers before sending the next hop to cover the next blind spot. Do you understand why Tomahawk fly at very low altitude while Delihah doesn't?" I am going to repeat what you said. ", they can fly both at high and low altitude like any normal cruise missile " you made a general statement saying "any normal" cruise missiles can fly both high and low I point out some cruise missiles that don't. What I am saying is be careful what you say. The new MALD decoys that are not out yet or soon will be have low altitude profiles or say they do but do not give an estimation yet as to their altitude height. One more thing where in the image does it show it can fly 600 meters(I must be blind)? I looked at the aviation source above as well and cant find it. Is it on the part where it says MSL and AGL if so simply what the means to me? But if that is as how low it can fly you can still distinguish it from a tomahawks 30-50 meter altitude estimation. Although I wonder what the US considers as low, mid and high altitude in estimations regarding flight profiles of missiles. Last edited by panzerfeist1; 16th January 2019, 15:45.
are those missiles 700kg class and single fighter can carry multiple of them to Mach 1.5 speed. there is no point of carrying high speed missile if it inhibit fighter from going supersonic. I already show you current warhead size is sufficient so they are making bigger warhead. the largest single missile system programeme for strike called Brahmos only interested in increasing speed not making it slower. with current technology Brahmos can fly upto Mach 5 in newer version. but higher speed than that will need new materials and engine. Also the nice Ventral area aircrafts have in comparison to missiles is drastic. I don't think there are any airborne jammers as far as I know on aircrafts that can jam HF or stealth material that can absorb HF. I am sure the readings of an aircraft and missile to the amount of surface area they have can be measured out. 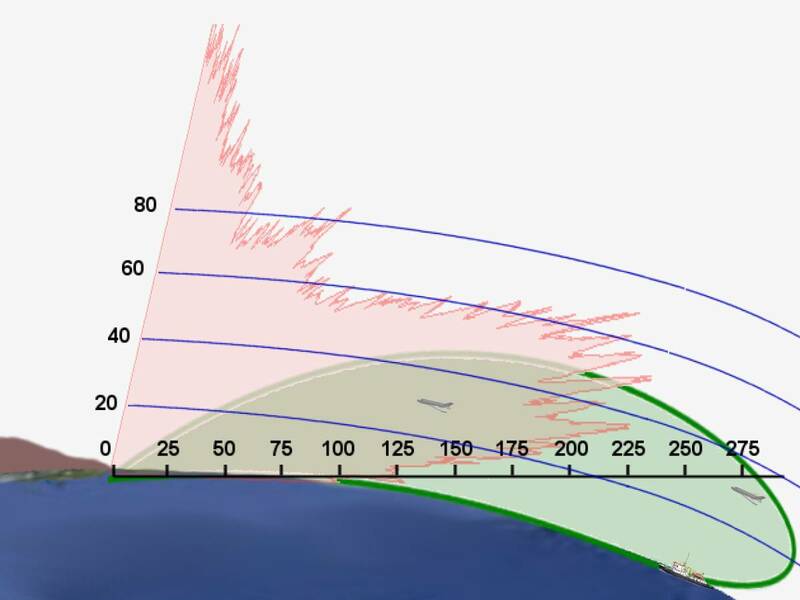 As said earlier, at 2000 km, the 2 degrees beamwidth will be 87 km in diameter,so the area of resolution cell is 5944 km2, you think the slight difference between a fighter and missiles will make a difference when the cell is that big? No, it won't, you can't even separate aircraft in a formation apart. you made a general statement saying "any normal" cruise missiles can fly both high and low I point out some cruise missiles that don't. "Can perform a certain task" # "Will be used in such fashion"
MOP can destroy tank, but no one will use it as an anti tank weapon, it a waste and too much collateral damage. Similarly, if you want, you can make a Delilah fly at low altitude, but there is no point. One more thing where in the image does it show it can fly 600 meters(I must be blind)? Unlike ROFAR that you talked about all the time, MALD-X had actually been tested in real world. But if that is as how low it can fly you can still distinguish it from a tomahawks 30-50 meter altitude estimation. What make you think Tomahawk, JSM, JASSM ..etc can't fly at high altitude? Besides, what do you think the range resolution of OTH-B radar is? are those missiles 700kg class and single fighter can carry multiple of them to Mach 1.5 speed. there is no point of carrying high speed missileif it inhibit fighter from going supersonic. already show you current warhead size is sufficient so they are making bigger warhead. Last edited by garryA; 17th January 2019, 02:36. GarryA I got some very good source information your going to like that I can proudly say this will be my last post regarding this topic. "As said earlier, at 2000 km, the 2 degrees beamwidth will be 87 km in diameter,so the area of resolution cell is 5944 km2, you think the slight difference between a fighter and missiles will make a difference when the cell is that big? No, it won't, you can't even separate aircraft in a formation apart. " " the resolution cell size is large, approximately 10 km by 10 km(example of the problem you suggested). Therefore, the signals from small targets that are approximately 100 m long are swamped by the clutter and are thus not detectable without resorting to other means, such as Doppler filtering. But it seems that pg 7 has the solution to this problem you mentioned. "By using EVA with an increased subtending angle of ±5° (Fig. 7(b)), the resolution cell size along the cross-range direction becomes as small as 80 m, more than a 100 times improvement in resolution. As a result, most of the beam can be focused on a target, so that the target signal becomes much stronger and sharper compared to the case without EVA. It should be noted that the resolution is determined by the subtending angle, regardless of the locations of the scatterers along the range direction. Also, the distribution of the scatterers can be sparse, but the separation between adjacent scatterers must be random to suppress the grating lobes. " "No they don't, when the approach angle reaches a certain limit, the wave will penetrate the ionosphere and can't bounce back. There is good reason when you look at the coverage illustration of OTH-B radar, it is always a cut fan shape rather than the full shape"
"This coverage is achieved using 5-to-28-MHz radio waves that reflect from the ionosphere. ROTHR is a land-based, high-frequency (HF) radar which can cover a 64-degree wedge-shaped area at ranges of 500 to 1,600 nautical miles." I am assuming anything below that 500 nautical miles you have said is a blind spot and cant be covered correct? I realized there was a 60 degree limit for some OTH radars meaning you can not get a 70, 80 or 89 degree coverage to get that blindspot covered but there is something that I believe we have both missed(although it benefits my point anyways of no blind spots). The red waves are gigahertz and green waves that you see on that image are the HF waves. and they can cover those remaining 500 nautical mile blind spot by simply just not needing to use the ionosphere. "Yes, AGL stand for Above Ground Level"
Alright I figured it out. It says 2k which makes me suggest 2000 feet therefore 609 meters hence your 600 meter statement. Thanks. "What make you think Tomahawk, JSM, JASSM ..etc can't fly at high altitude?" Last edited by panzerfeist1; 17th January 2019, 04:47. I got some very good source information your going to like that I can proudly say this will be my last post regarding this topic. I found a very good answer for this and I am sure you will be surprised. The Surface wave OTH radar, also known as OTH-SW, they overcome the limitation of the earth curvature by using a very low transmission frequency from 1.6-3 Mhz (could be up to 20 Mhz). These electromagnetic waves tend to bend around edges or curves, they are coupled to the conductive ocean surface forming a “ground wave” that can bend over the horizon and will follow the curvature of the earth, this is the kind of OTH radar without blind range but the maximum detection range is only around 300-400 km and they need to be on the shoreline because they relies on the conductive characteristic of the ocean. Even if you can merge the two, you still have the blind range. Last edited by garryA; 17th January 2019, 09:28. I assume both of you realise that skywave propogation only works for certain periods of a day... It is not a 24/7 radar and therefore has significant tactical limitations. I want to add that OTH radars are early warning radar but not all early warning radar are OTH. Under normal conditions only frequencies below 30MHz are capable of forming a skywave for OTH capability. However, ionospheric modifiers can be used to transmit higher frequencies. Do you mean weather altering machine? I don't think anyone would argue that OTH radars can't detect LO targets (aircraft, cruise missiles) at long range. Does that have tactical implications? Does it negate the employment of LO aircraft? In other words "who cares?" We are talking about a huge fixed radar system that a few miles in length and have a blind area that is between 900-2700 km in front of it. I don't know you put irrelevant pics. none of your pics shows the multi-shot capability of high speed missiles nor the launch speed of aircraft nor any manufacturer link for such information. Plus that Japanese engineering is joke. just look at Fukashima and its aviation industry. its country is no longer capable of breakthrough research. so why even post such pics with draggier aircraft with fuel tanks. The Brahmos with increase speed of between Mach 3.5 to Mach 5 is not same as hypersonic brahmos. Brahmos has order book of $4.5b in 2018 and to that past 20 years of procurement. its huge project just integration complex in India is 40 acres. plus 20k people from NPO working on technologies developed based on it. The IAF is reported to have placed orders worth approximately USD650 million for the BRAHMOS-A. you will be hearing about Brahmos for next 50 years atleast. it will have much longer and versatile life than MIG-21. For once, use your brain like normal people, you could have easily search for the information by the name i gave, the photo is to illustrate their size. For Rampage,it take likes 2 seconds to Google the production video. The photo of ASM-3 speak for itself. Now, where is the photo of Flanker with multiple Brahmos? where is the evidence that it can reach Mach 1.5 with Brahmos?, you said yourself that supersonic missile are useless if the aircraft can't carry multiple of them and can't reach Mach 1.5 with them, so now by your logic clearly Brahmos and Kinzhal is useless??? Last edited by garryA; 18th January 2019, 06:02. None your pics prove supersonic launch of missiles. Kh-31/Kh-58 not have same role as Kinzal/Brahmos even though Kh31/kh58 are multirole. Even existing stock of brahmos missile can be upgraded to long range version. show me other missile whose range can increase so easily to existing stock? Mach 3.5 to Mach 5 Brahmos is not same project as hypersonic Brahmos. Zircon already at Mach 8. Don’t assume stuff when you lack scientific insights. Did you drop that argument about size , scope and procurement of Brahmos project? or its continuity to infinity. As reported earlier here on Livefist, a ‘final’ BrahMos version, sporting a range of over 900 km, will complete modifications and be ready for a first test by the end of 2019. Oh really? even the one where F-35 carried AARGM-ER internally and doesn't affect its top speed at all. Originally posted by "JSR "
Kh-31/Kh-58 not have same role as Kinzal/Brahmos even though Kh31/kh58 are multirole. Don’t assume stuff when you lack scientific insights. Last edited by garryA; 18th January 2019, 07:48. No, I mean ionosphere altering machines, although some foil hat fashionistas claim that those machines alter the weather too. Sunspot activity and certain weather conditions can also duplicate this affect, which is why you get E-skip, F2-skip and Tropospheric propagation. On this a particular mention to XB-70 #43 post that explain how state-ot-the-art avionics of F-35 with its emphasis on sensor- and data-fusion can be a real help in many scenarios involving both A2A than A2G. Above all because he IMHO correctly point how this capability is not exclusive to it but can involve all planes of the same gen (and I would add also other planes actually in production/deep modernization process). I would put a less emphasis on internal carrying of weapons, planes like Mig-31 or Typhoon carry their missiles in semi conformal recesses and also in other planes designed for aerial combat there is always been the research of the least possible impact of weaponry to general performances, so an advantage exist but is not so decisive. I appreciate the compliment, Marcellogo. This thread started out with promise, but now it's gone. And I didn't think I was emphasizing internal weapons storage too much, but I can understand different interpretations of what I wrote. I mainly stressed the comms and sensors. In the event of a stealth bomber attack, detection ranges would be very short and so a tight "picket" would be needed. And the sensors and comms would be crucial. And with large stand off bombers, the missiles would spread out over 100s or even 1000s of square miles. That is too great an area for one aircraft to cover and so they will need to signal one another and work as a team once again. I only briefly mentioned the internal weapons of the F-35 because many modern fighters appear to get the best of the F-35 without taking them into account. They even the odds to a point. Anyways, this thread is pretty much dead.